Freelancers are often surprised how much time they spend chasing invoices – you provide a service and expect to get paid on time. 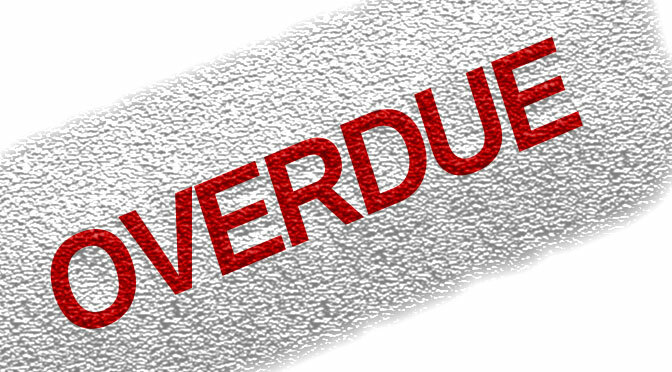 For the accounts departments at SMEs (small and medium enterprises) it is often a badge of honour to delay payment to the last day or longer! Invoices from freelancers can get pushed to the back of the queue with an attitude that “we’ll pay you when we are ready”. For some businesses there may be cash flow problems where they are waiting for money to come in from their customers. The freelancer, with relatively little clout, will often have to wait until more important suppliers are paid. Having so far presented quite a negative picture, there can simply be times when people have innocently forgotten to pay you! So what can you do to minimise the time you spend chasing invoices? It is relatively easy to find out whether a business is a sole trader or limited company. You may have had the opportunity to visit the business to get a feel for the operation – if not a quick Google search for a website, reviews of the company or a Google maps search for an address, will help. There are also plenty of websites where you can obtain a credit report, although you will probably have to pay for these. If your potential customer does have a low credit score, don’t completely write them off as there may be legitimate explanations for this. It would be worth asking for a deposit up-front if this is the case. It probably sounds an obvious point but ensure that you put a due date in the invoice and somewhere prominent where it won’t get missed. Ensure that it is obvious how you want to be paid and that it is a method that you customer is happy with – some businesses will not want to pay by cheque. If the customer hasn’t specified in advance how long they require before payment, then you may as well make this as soon as possible; perhaps 7 to 10 days. There is no reason why any company can’t turn an invoice around in this amount of time it is only a question of whether they are willing to! The person you deal with may not be the individual responsible for paying your invoice so it might be worth contacting the appropriate ‘accounts’ person after you have checked with your direct contact. You can always politely enquire whether there were any issues with your invoice or if there is anything else you need to do to help. Get to know your customers processes – it might be for example that the company always pays their invoices on a Friday and yours is due on a Thursday, in which case you know to wait an extra day. It does no harm to check the situation with your invoice a few days before it is due. You can always enquire whether the customer has got the invoice and whether it is all ok? If you wait til the invoice is overdue, it could turn out that they didn’t get it or that they had a query with it – don’t leave this avenue for potential delay open if you can possibly help it. Follow up emails with phone calls. Speak to the person who deals with you directly and ask them to chase it. If this fails speak to the ‘accounts person’ directly. If this fails, speak to the boss. If it has got to the stage where people don’t answer the phone to you then call from another number or try the switchboard. Don’t sit back and do nothing – keep chasing! In most cases unpaid invoices for freelance work is down to miscommunication and/or incompetence. The more on top of things you are in terms of due dates and lines of communication, the more likely you are to head off problems before they escalate.